Be the first to share your favorite memory, photo or story of CALVERNA. This memorial page is dedicated for family, friends and future generations to celebrate the life of their loved one. Mrs. Calverna Ann “Kelly” Glidewell, age 89, of Springfield, Missouri, passed away on Tuesday, January 22, 2019 in her home. She was born on August 23, 1929 in Red Wood Falls, Minnesota, the daughter of the late Nicholas and Sophia (Wolniewicz) Thomas. She was united in marriage to Bernie Eugene Glidewell on November 7, 1953 and were blessed with 63 years of marriage before Bernie passed away on May 24, 2016. Kelly was a member of the St Joseph Catholic Church in Springfield. She loved spending time with her family, enjoyed cooking, sewing, crocheting, and polka music. 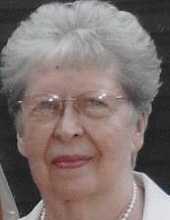 She is survived by her four children and their spouses, Steven Eugene (Leamoshia) Glidewell, Karen Ann (Johnny) Allen, Debora Gail Bond, and David Alan Glidewell; ten grandchildren; 14 great grandchildren; two sisters, Carol Woelfel and Eleanor Paluck; numerous nieces and nephews; and many friends. To send flowers or a remembrance gift to the family of CALVERNA ANN GLIDEWELL, please visit our Tribute Store. "Email Address" would like to share the life celebration of CALVERNA ANN GLIDEWELL. Click on the "link" to go to share a favorite memory or leave a condolence message for the family.